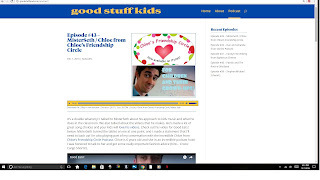 From the Ponder Couch: MisterSeth interview on the Good Stuff Kids Podcast! MisterSeth interview on the Good Stuff Kids Podcast! I got interviewed for the Good Stuff Kids Podcast! "I got interviewed for the great Good Stuff Kids Podcast! I blather on about writing music for children and their grown up! The podcast is great for anyone with kids! Do yourself a huge favor and check out all of the other episodes! Mike interviews everyone from Caspar Babypants to Laurie Berkner to the head writer of "Go Diego Go" to people who make great clothing for girls to... it goes on and on! Plus there is a top 4 + 1 list of songs (4 his children request and 1 classic he tries to get them to appreciate). It really is some of the best "Good Stuff"! You really should go check it out! It's a great resource for parents! Good Stuff is great stuff!